Where is the best place in my house for my bedroom? Where’s the best place for my home office? 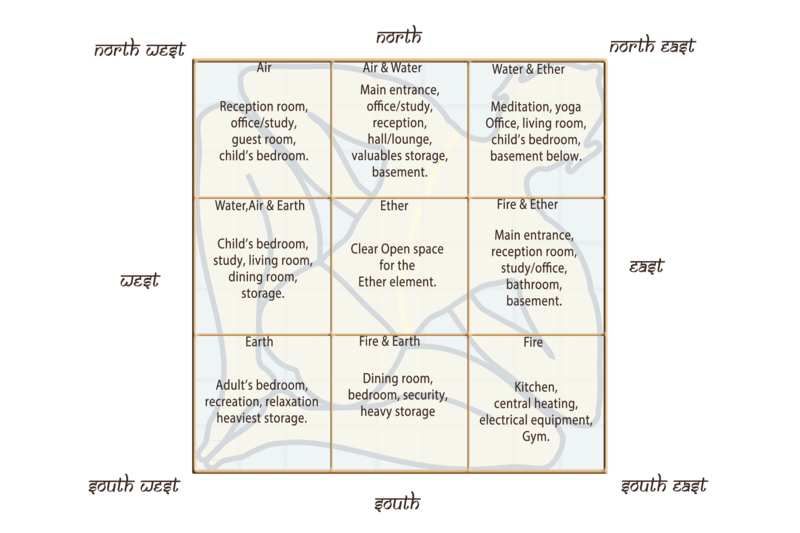 Using the scientific principles of the twelve Vasati laws, this diagram shows the ideal room placements within the eight compass points of your home. You can see where the five natural elements; Fire, Water, Ether, Earth and Air are prevalent within each direction. Positive Energy potential of the elements, weights and space as well as favourable and supportive planetary influences are best achieved by assigning the room functions as depicted. The centre (Brahma sthana- the seat of Lord Brahma) of your home is sacred space ideally reserved for family members to come together and socialise. The life flowing energies begin to slow down in the South as they come from the Southeast. Energies are now totally consumed by the time it reaches the Southwest. The Western energies are also now coming to depletion as it becomes used up in the Northwest. As a result of the negative energies in the South, Southwest and West these areas are best made still and heavy and best used as bedrooms and heavy storage. Another important consideration when choosing your personal rooms in any given space is to refer to your Unique Personal Direction which is calculated from your astrological birth data. Rahu is known as the northern lunar node. According to Vedic understanding Rahu is a subtle planet and is considered to be the most vicious of the nine planets. Rahu adopts the qualities of the planet which rules the sign it is placed in and its influence can also be felt on the psychological plane. The feet of the Vastu Purush lies here and all energies following the path from the North and East terminate here, after being ‘used up’ or consumed, providing the Earth element and Negative Energy potential. Rahu represents large and dark rooms. Ideally any windows in this area should be smaller in size or less in quantity than windows in the rest of the building. Due to the depleted energy in the Southwest direction, it should be made heavy and blocked with either large furniture or immovable heavy storage, like a pivot for the building. The best room functions are as an adult bedroom, store room, stair case or as an executive or directors office at work.The Southwest also works well as a relaxation space, especially for women. The Southwest wall is a good place to keep photos of parents and close family members especially the elders or grandparents, teachers and your Guru. Images of landscape with tall mountains symbolise the quality of ‘large’ and ‘heavy’. This area is suitable for the owner of the property and anyone whose influence is appreciated and welcomed. Please avoid water and fire on the Southwest point of your home or building in order to avoid a clash of elements with the earth element here. Slopes in landscape should not give lower land in the Southwest as this will increase this ‘dead’ energy in your plot. 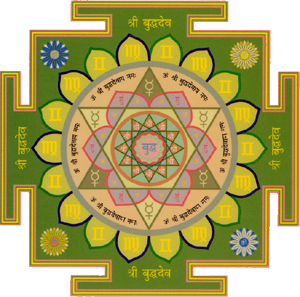 Whilst chanting the Varahadev mantra, you can place its Yantra (see top of page), on a Wednesday afternoon, in the Southwest point of your home or work place thus nullifying any Vastu discrepancies on the energetic and karmic levels and thereby create a space where you can get in touch with the beneficial qualities of Rahu. 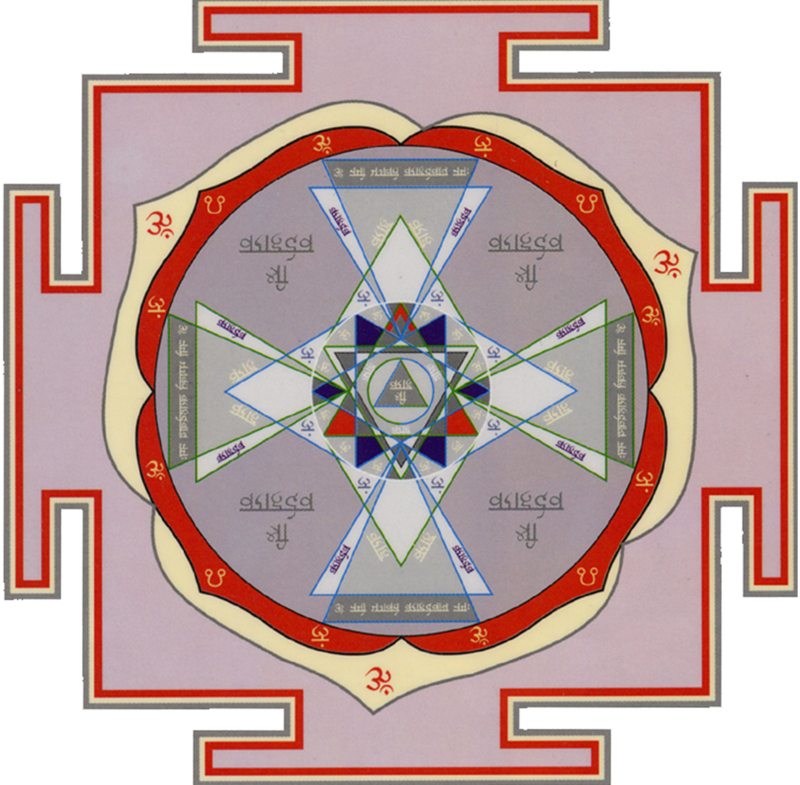 Any severe spatial defects can be further transformed and harmonised with the installation of the Vastu pyramid in the centre of your property or on the Southwest point, which will work well in conjunction with the Varahadev yantra on your wall. Please contact me for more information on Yantras and Pyramids. Increase your power and influence within the social status. This direction enhances power, fame, fulfilment of desires and strong Vastu here will lead to harmony with the collective trend, increase prestige, popularity, fame and power. Positive Vastu here insures profitable influences in business and continued cash flow and personal strength. The heavy weight acts as a pivot for the Vastu purush as his feet are placed here, giving a sense of stability and grounded-ness. Vastu shastras say that good Vastu can help the owner be more in control of the mind.